Thats it we all are fucked!!! We’ll be fine. Just provoke him to fire everything, and the overheat will burn all that cardboard. The smiley face on the top picture makes it even more win. 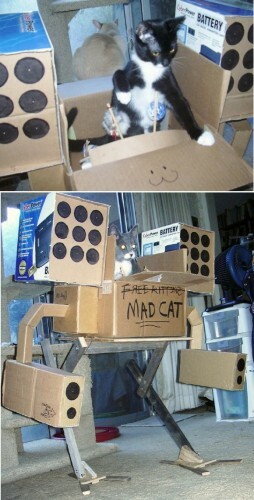 Who is the suicidal genius that thought that giving a cat a mech was a Good Idea? Mr.Jingles WHERE DID YOU GET THIS UPGRADE?!!? Man, now I wanna go play the game! It’s too late. You just lost. @nyokki: Agreed. This is Absolute and uncompromising WIN! PREPARE FOR CLAN KITTEH ALPHASTRIKE!! !